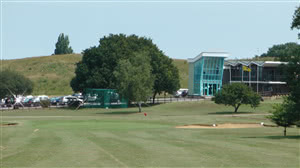 Bar, Full catering, Changing rooms, Pro Shop, Equipment hire, Driving Range, Putting Green. First things first, I played here as part of Mark Crane's Celebrity Golf Day and as posted in the forum, this is a great day out and all down to Mark and his superb organisational skills. I liked it. The course meanders through parkland terrain with some hills to negotiate but nothing that will leave you that out of breath. The greens are flat and true BUT there are some nasty cracks and poor quality grass on some. The Par 3's are a good challenge and there is plenty of good holes to keep you occupied and some I really liked. The clubhouse staff were all very friendly and the food and drinks at the bar were very reasonable priced. The food itself was very good! Would I rush back? No. There are too many other courses, still to visit. Would I play there again? Certainly and look forward to joining Mark and his crew there again next year! pleasant helpful staff, and a very nice layout of the course. Unfortunately the green keeper vanished early and didn't cut the greens, so they were a tad woolly making putting rather tricky, and the fairways looked as though they hadn't been cut either. But the course is a good one, some holes are rather generous off of the tee, others not so much. When I play here again, I will be looking forward to it. For the money, Deangate Ridge is a well run council golf course. Pros and Clubhouse staff, very friendly. Well worth a visit! !